Three and a half years ago I offered the Hyper-Extended Oracle Performance 6.0 Beta for download – that Beta version expired a year later. This program has been somewhat of a pet project for the last 13 years (almost 10 years at the time of the previous Beta offering), so I was excited to read some of the feedback about the 6.0 Beta. The minimal feedback had me wondering for a while, then the pet project was pushed to a dark corner for roughly three years. I taught the pet a few new tricks on Windows 10, so I thought that I make the latest version available. Unlike the previous Beta, Beta 7.0 does not have an expiration date. NOTE August 17, 2015: The first two download links are working now – Wordpress was blocking the downloads. Note that the first two downloads are actually compressed .zip files with a .doc extension – inside those .zip files are the files that are of interest. Right-click the files, save the files to your computer, then rename the files to end with .zip. Update August 20, 2015: If you have an old computer, you may need to put the MSCOMCTL.OCX file in your C:\Windows\SysWOW64 folder (on 64 bit Windows, or C:\Windows\System32 on 32 bit Windows). You will then need to register (process) the file with REGSVR32 – see the command in the instructions below. A recent version of MSCOMCTL.OCX may be downloaded here: MSCOMCTL.OCX (save the file, then rename the file as MSCOMCTL.OCX). 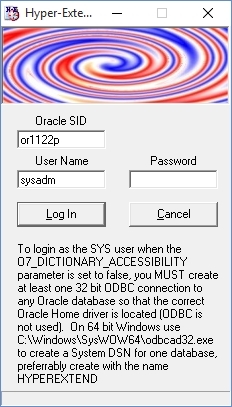 Windows 2000 through Windows 10, 32 bit Oracle Client, MDAC/ADO 2.8 (or greater – preinstalled starting with Windows XP), connection to the Oracle database by database SID (tnsnames.ora) using Oracle’s Oracle Provider for OLE DB (Oracle’s Oracle ODBC Driver is required for connections that are initiated by SYS – primarily for access to the Advanced Init Parameter functionality), Excel 2000-2013, Microsoft Grid control (provided in the download – put into the program’s folder), TIMED_STATISTICS set to TRUE. Most features require DBA permissions (SYSADM or SYS), or specific grants to views or packages. For example, sessions that use the DBMS Xplan and Trace functionality must have permission to execute ALTER SESSION, have execute permission on the DBMS_XPLAN package, and select permissions on V$SQL, V$SQL_PLAN, and V$SQL_PLAN_STATISTICS. Configuring session tracing requires execute permission on the DBMS_SYSTEM package and/or the DBMS_MONITOR package. The Hyper-Extended Oracle Performance Monitor provides a variety of functions to simplify working with and performance monitoring Oracle databases. Various types of simple data dictionary and database instance related reports may be generated in Excel by simply putting a check in a box on the program’s main window, and clicking the Report button. 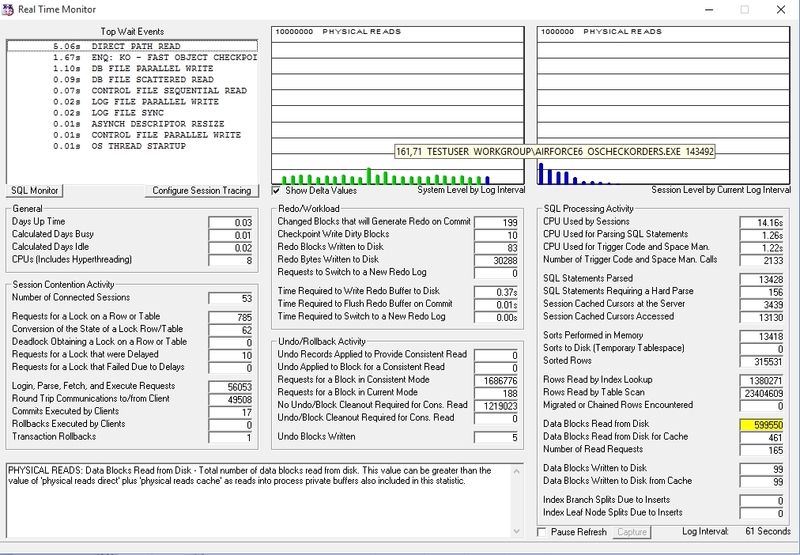 Generating DBMS Xplan output (using the raw information from a 10046 level 4/12 trace) with optional 10046/10053/other traces, creating data change logging triggers using the data dictionary, peeking at the hidden and non-hidden initialization parameters, and access to a quick Oracle keyword search are also a click away on the program’s main window. Performance monitoring and tracing tools for checking a cross-reference of the time model and wait event statistics (at the system and session levels), checking a cross-reference of the system statistics and wait event statistics (with drill-down to the session level), reviewing potentially high-load SQL statements and their execution plans, cross-referencing the current session waits with enqueues, and enabling various types of Oracle traces are also a click away on the program’s main window. Permanently recording of performance monitoring statistics in a Microsoft Access compatible database (Microsoft Access is not required) is also a click away on the program’s main window. -D The Database instance SID to which the program should connect. -U The user name to be used for connecting to the database instance. -P The password to be used for connecting to the database instance. -LHC 60 Species the minimum CPU time that is considered high load to 60 seconds accum. -LHE 90 Species the minimum elapsed time that is considered high load to 90 seconds accum. 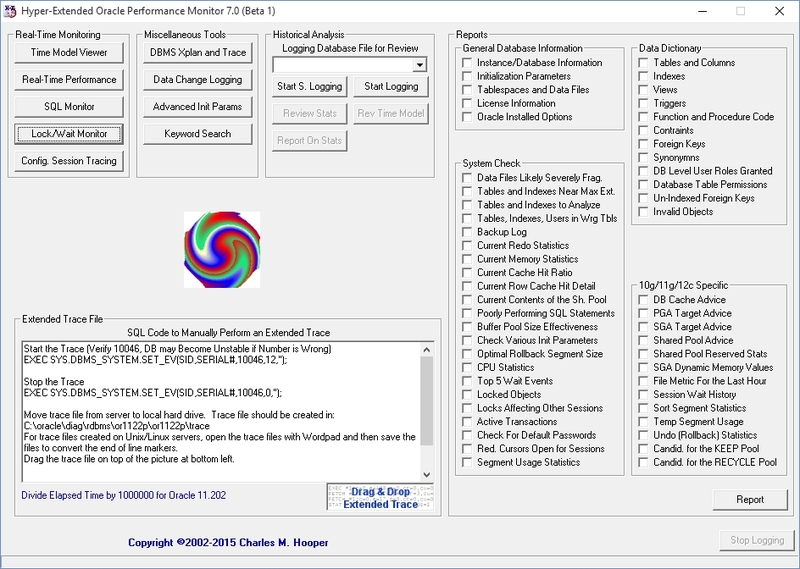 The Hyper-Extended Oracle Performance Monitor runs on Windows 10, even though the touchpad on the Sony laptop sometimes stops working until the computer is put to sleep and then awoken. The program should also work with Oracle Database 12c (and might still be compatible with Oracle Database 8i, although the Time Model Viewer will not work). As mentioned above, the documentation is still incomplete, with several pages of the documentation containing nothing but pictures. It takes a lot of effort and time to put the documentation together, so I will try to piece it together over the next couple of months. You might be able to refer to the older documentation if the pictures are not self-explanatory. If you find the program useful, please leave a note. If you need help understanding a program window or the generated output, leave a comment attached to this blog article and I will try to help. the download link for Hyper-ExtendedOraclePerformanceMonitor7.zip is not working .. I am seeing the same problem – cannot download Hyper-ExtendedOraclePerformanceMonitor7.zip or Hyper-Extended Oracle Performance Monitor7.doc, although I am able to download the old documentation. I am not sure if this is a problem with the file attachment size, or if WordPress is simply blocking those types of files. I will try to fix the problem in 12 hours. Thank you for bringing this problem to my attention. Thank you very much Charles for sharing your tool. 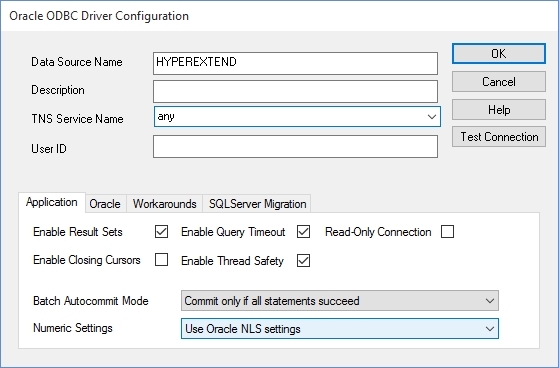 I created a 11g ODBC driver called HYPEREXTEND. I then launch a .bat to work on a 10g database. Sorry for the french. Would you like me to translate a few words ? Jean-michel from FRANCE, interested in your posts and your books reviews. The HYPEREXTEND ODBC driver is only required when displaying the Advanced Init Parameters, or when logging into the program as the SYS user. Some functionality will not work correctly when the ODBC driver is used – I think that this is only a problem when traces are enabled or disabled in other sessions. In general, the SYS user probably should not be used in the program, but you do need to make certain that the username that you are using has permission to select from the various V$ views. The program reads the USERPROFILE environment variable, rather than making a Windows API call, to determine the location where the ORACLELOG folder will be created. There is a benefit to this approach – if you would like to have the ORACLELOG folder created somewhere else, and you are starting the program from a .bat file, you can change the USERPROFILE environment variable in the .bat file, and it will only affect the programs that are started within the .bat file (the Hyper-Extended Oracle Performance Monitor). 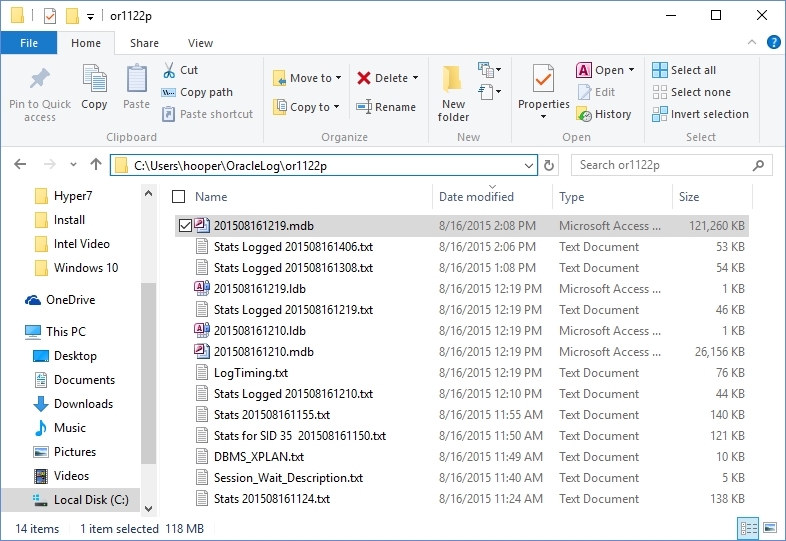 There is a chance that the ORACLELOG folder is not being created inside the location specified by the USERPROFILE environment variable (that could be the problem if your USERPROFILE environment variable has a \ at the end, as would be the case if your user profile was moved to the root of a mapped drive letter, such as H:\ or Z:\). The OracleLog folder should be created the first time you start the program. When you create a report in the Hyper-Extended Oracle Performance Monitor, the program writes a tab delimited text file into this folder (actually in a folder inside this folder), and then tells Excel to open the text file, referencing it as a QueryTable. If my program crashed, that text file should still be present in the folder (I think that the file is named Report.txt). Does that Report.txt file exist in the expected location? When trying to create a report in the program, Excel would start, the Report.txt file would be created, but the Excel window remained blank and the program locked up. I am not yet sure why that would happen. Setting the USERPROFILE environment variable back to the default value allowed Excel to open the report. I will look into this issue later today. Jean-Michel, please let me know the results of your test when you have some time to experiment. A second comment while trying the Time Model Viewer functionality. “The selected sheets will be deleted permanently.
. To cancel the deletion, click on Cancel. A click on OK and excel displays a gray window with no information on it except a few icons in the menu bar. I have tested the Time Model Excel chart functionality with Windows XP Pro and Excel 2003, Windows 7 Pro (and Ultimate) and Office 2010, Windows 10 Pro and Office 2010, and Windows Server 2012 and Office 2013. The Time Model Excel chart functionality seemed to work in all cases, although the charts in Excel 2003 did not look as nice. The message “The selected sheets will be deleted permanently” never appeared with those versions of Excel. That said, I have an idea what would cause that message to appear. My program instructs Excel to create a new workbook. It then verifies that at least two worksheets are in the new workbook, and if not, it creates blank worksheets until there are two worksheets. A typical installation of Excel will create three worksheets by default when a new workbook is created. As such, next the program instructs Excel to delete the third worksheet until there are only two worksheets remaining in the workbook. If these worksheets are not completely blank when deleted, Excel will display the warning “The selected sheets will be deleted permanently”, and ask if you would like to continue. Do you use the standard Excel blank workbook template in Excel, or has the standard template been replaced so that default text appears on a worksheet? Do you have macros in Excel that automatically add text to a worksheet when a workbook is created? I am able to shut off that warning when the excess worksheets are deleted, but I am now curious why Excel does not consider those worksheets as being blank. The gray screen in Excel is caused by the Hyper-Extended Oracle Performance Monitor. It instructs Excel to stop updating the screen when each value is entered into the worksheet, which greatly decreases the time to update the spreadsheet. At the end of the update process it instructs Excel to update the screen, which will make the gray screen go away. It appears that my program crashes before the update process completes, causing the Excel window to remain gray. Anyone else see these issues (or not see these issues)? Is it specific to the French version of Windows/Excel, an Excel template issue, a virus scanner issue (some virus scanners will block a program from remotely controlling another program, although the Hyper-Extended Oracle Performance Monitor controls Excel through its published command API), the location of the user profile, or something else? Thank you Charles for the answer. I’ll check asap ( tomorrow in fact ). In fact I did not mention my versions … Sorry. I have an old excel version but given you mentioned that Excel 2000 is supported, I do not think that is the reason it failed. It has been a long time since I tested Excel 2000, but I did test Excel 2003 a couple of hours ago on a nearly 10 year old Windows XP Pro computer. Which Oracle Client version are you using? 11.2.0.1 Client has issues with ODBC ( https://hoopercharles.wordpress.com/2010/11/02/11-2-0-1-odbc-update-problem/ ), 11.2.0.2 Client seems to be OK, but occasionally has issues with certain OLE DB issued SELECT statements. 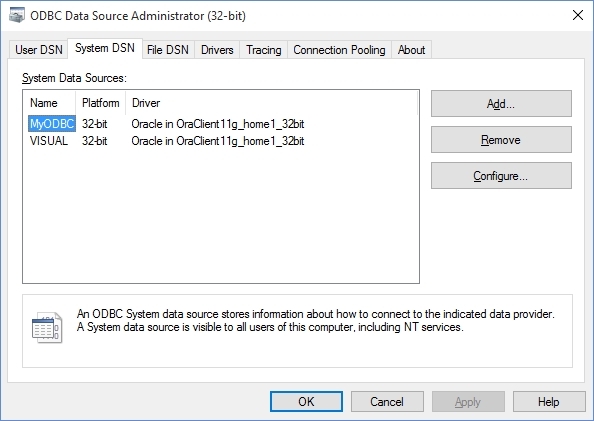 11.2.0.3 Client does not install OLE DB correctly ( https://hoopercharles.wordpress.com/2012/11/25/connecting-to-an-oracle-database-with-visual-basic-6-0-on-windows-8-64-bit/ ) but is fixable. I strongly suspect that there is an issue with the USERPROFILE environment variable based on some quick testing this morning. 1) My USERPROFILE environment variable does not end with a \. 3) I run HEOPM from a PC where I have installed a 11.2.0.1.0 database. 1) In report mode, I manage to close the error window to then read the excel sheet with the data in it. Once the sheet is closed, no error occur. 2) In Time Model Viewer mode, the HEOPM window remains greyed. When clicking on “Update” at the top left of the Excel sheet, I have an Excel “unaccessible file” window. When clicking on OK, I can see the 4 charts with no data in them. When closing, Excel wants logically to know if I need to register the updates. Thank you for the additional information. Since my program is able to create the charts, that means that it should be able to write the statistic values into Excel that are retrieved from the database server. Your USERPROFILE variable does not appear to be a problem. It may be a permission problem with the Oracle username that you are using to access the database – the program does a quick check to see if the Time Model Viewer should be enabled or disabled (based on Oracle Database version, if I remember correctly). I created a test user and did not grant that user any permissions – the Time Model Viewer was disabled, but not the Real-Time Performance feature. If I grant the user permission to V_$DATABASE and V_$INSTANCE, the Time Model Viewer button is enabled, but the program locks up (the Excel window never appears either). Are you able to create a 10046 trace at level 8 or 12 for the Hyper-Extended Oracle Performance Monitor, and then try to start the Time Model Viewer? If there is a permission problem, you should see lines in the trace file indicating tables/views do not exist. No error at first glance. Thank you for posting the trace. 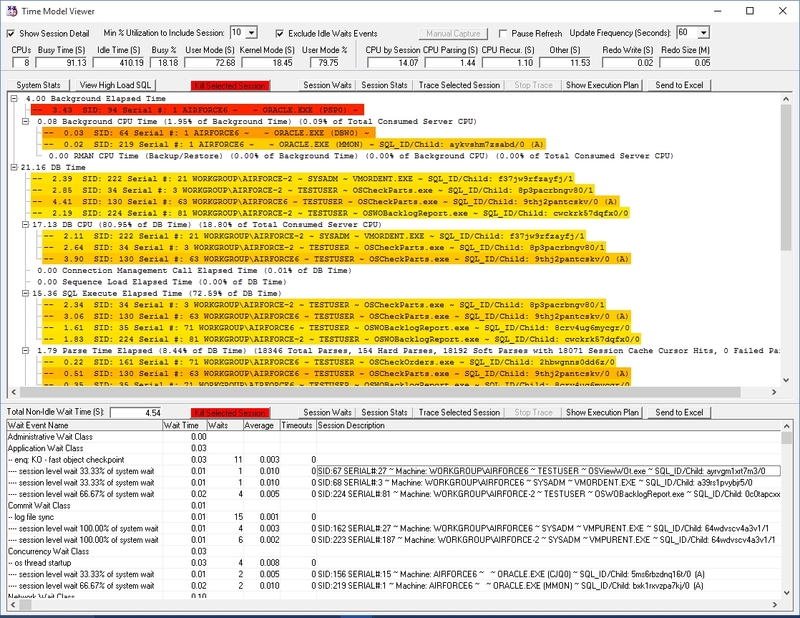 I might be reading the trace file incorrectly, but it appears that you may have enabled a 10046 trace for your SQL*Plus session for 47 seconds, rather than the session for the Hyper-Extended Oracle Performance Monitor program. 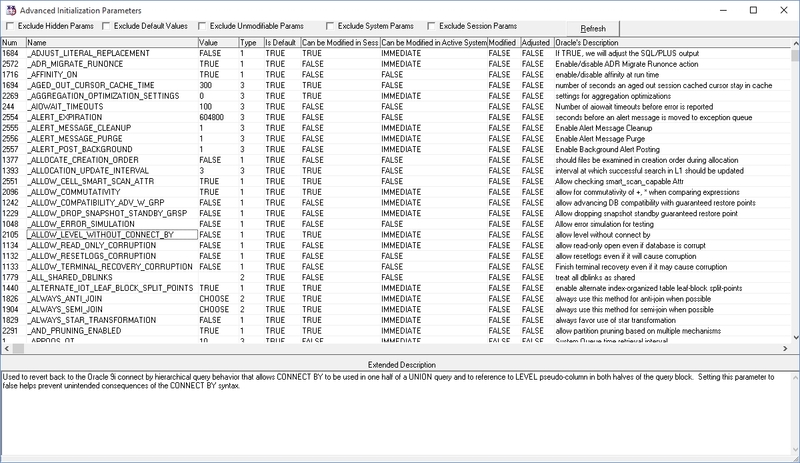 Note that enabling 10046 traces is something that may be done within the program by using the Config. Session Tracing button in the program’s main window, but it will be easy enough for you to enable this trace using SQL*Plus. I might try to do a little more testing later tonight to see if I am able to duplicate the problem that you are having with Microsoft Excel. Do you have a virus scanner on the computer – there is a small chance that a virus scanner could be blocking some of the communication. However, you told me that the program was able to create a couple of charts in Excel, so that is not likely. A macro in Excel that automatically executes when a cell’s value changes might be causing some issues if you do not see any errors in the 10046 trace file. In Excel 2007 and above it is not easy to view the macros that are set up in Excel because by default the Developer menu is turned off. If you use the Time Model Viewer, and you see that four charts are created, please right-click the Charts tab and select View Code. My program does not create any macros in Excel, so you should not see any macro code when you view the code in Sheet1 (Charts), Sheet2 (Statistics), ThisWorkbook, or any modules (Module1, Module2, etc) when clicking those items in the Project Explorer (you may need to select to view the Project Explorer from the View menu). Normally, I would expect this reporting to Excel to just work without having to go through a lot of troubleshooting. Is anyone else having similar problems with the Hyper-Extended Oracle Performance Monitor program and Microsoft Excel? Immediately after the above, the current time is put into cell A2, and the number 0 is entered into cells B2 to J2. If you are able to see the charts, but cannot see the current time in cell A2 or the number 0 in the cells B2 through J2, then the issue is very likely that copy to the Windows clipboard or paste from the Windows clipboard is not working. If you want to try an experiment, create a new Excel spreadsheet, highlight cells A2 to AC1000, press Ctrl C to copy the cells to the Windows clipboard, click in cell A3, then press Ctrl V to paste the cells from the clipboard. Modify those lines. Inside the ” ” specify your username, password, and database SID, just as if you were starting my Hyper-Extended Oracle Performance Monitor. Save the code, then press the F5 key to run the code in the UserForm. Do you have the same lock up problem when running the macro code in this spreadsheet? Thank you for the last updates. I am so sorry for the 10046. Being not used to it, I got confused and I thank you for your patience and your very clear explanations. After a richt click on the Charts tab, I do not have any code whatever the sheet. There are no number on the whole Statistics sheet, only the header. I will try the experiment asap along with the 1046 trace content. Btw it is not easy to find the trc associated with the 10046 among many trace files, given Oracle reuses it as far as I can see. On my windows 7 PC, I am going to try to use PowerShell to easily find a text string like ‘PARSING IN CURSOR’. The trc file has a 251 Ko size. How can I find permission problems given there are no ‘ORA-‘ or “permission” strings in it ? As for the experiment, I do not know what AC1000 means. I created a new sheet then copied from A2 to IU2 ( sheet maximum line size ) and pasted the line into the A3 cell : no problem. I wii try the 2011/08 project asap. As I mentioned above, right now I do not think that it is a permission problem in the Oracle Database. If it were a permission problem, I think that ORA- or the word error (or the French spelling of that word) would appear in the trace file. 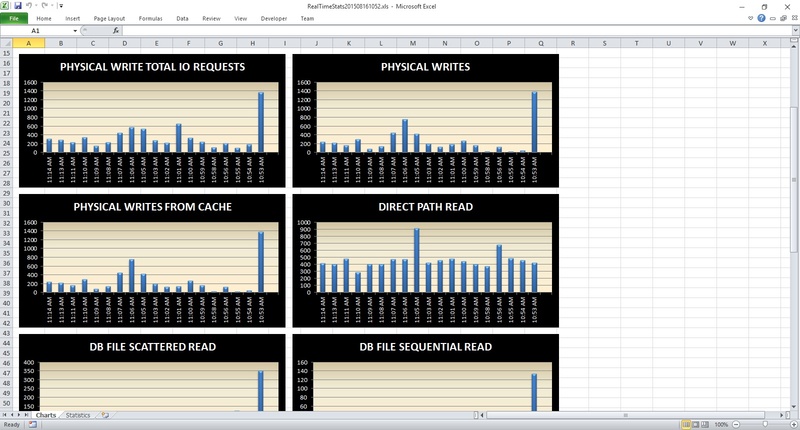 The Excel charts are created _after_ the database performance views are queried. 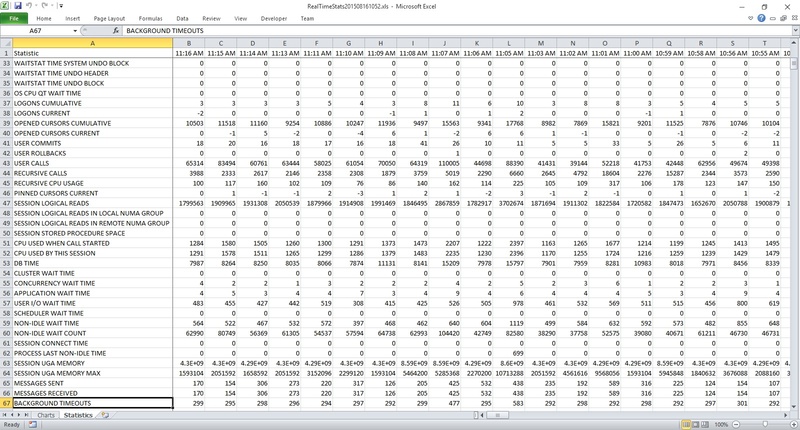 Immediately after the charts are created, a large number of cells on the Statistics tab in Excel are copied, and then pasted one row down in Excel. Immediately after the copy-paste, the current time is entered into cell A2 of the Statistics tab. Based on the information that you supplied above, the problem appears to be either with the copy-paste operation, or where my program enters the current time into cell A2 on the Statistics tab. Regarding AC1000, the columns in Excel are labeled A, B, C, D, …, Y, Z, AA, AB, AC, AD, … AY, AZ, BA, BB, etc. To highlight cells A2 to AC1000, click in cell A2 (the cell in the first column, second row), hold down the Shift key on the keyboard, while holding down the Shift key, press the right arrow key on the keyboard roughly 28 times to reach column AC, then while continuing to hold down the Shift key, hold down the down arrow key (or press it 998 times) on the keyboard until row 1000 is reached. You may then release the Shift key once all of those cells are highlighted. Next, hold down the Ctrl key and press the C key to copy the cells to the clipboard. Finally, click in cell A3, hold down the Ctrl key, and press the V key to paste the cells. This will paste the cells over the top of the existing cells, one row down. You should not receive any warnings or errors when doing this operation. Just to let you know, the error word cannot be found in the trace file. As for the AC1000 experiment, it works. I managed to copy all the selected celles into the A3 cell. Thank you for the update. The “Compilation error – project or library not found” error message may be very important. 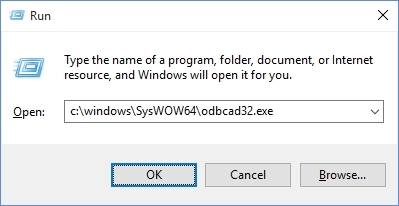 So, you might need to verify that the MSCOMCTL.OCX file is on your computer, installed in the correct folder (64 bit computers: c:\windows\SysWOW64\MSCOMCTL.OCX , 32 bit computers: c:\windows\System32\MSCOMCTL.OCX ), and that the file has been processed (registered) by REGSVR32. If you do not have that MSCOMCTL.OCX file on your computer, and registered, that *might* be what is causing my program to crash (but that would not explain the crash when sending a report into Excel) – I think that Vista had a problem where the file is not correctly registered. It really should not be this difficult to use my program – sorry for the problems. Edit: Note that I added a download link for a recent version of MSCOMCTL.OCX in the article above. The MSCOMCTL.OCX file is located at the right place ( C:\Windows\System32 ) on my windows 7 Pro 32 bit computer. I even registered the ocx again just to see if all worked well. It was ok. The Hyper-Extended Oracle Performance Monitor should work without issue on Windows 7. I cannot think of any other reason why it crashes when trying to communicate with Microsoft Excel. Could you try testing it with your virus scanner disabled – specifically the part of the virus scanner that checks for unauthorized changes? The Hyper-Extended Oracle Performance Monitor program does not attempt to make any changes to your computer, but some virus scanners detect programs that remotely control other programs (Microsoft Excel) as being bad programs. You should NOT need to disable the virus scanner, but you might try doing that to see if it makes any difference. For example, I wrote a program that opens the Windows 7 (now Windows 10) Windows Explorer to a particular folder on a NAS that has a large number of security camera videos. Once the Windows Explorer window is open, my program sends a Ctrl Home keyboard command to the Windows Explorer window, and then roughly every 0.8 seconds my program sends a cursor down keyboard command to the Windows Explorer window (actually the program that currently is receiving the keyboard input) roughly 1000 times. The Trend Micro virus scanner detected this activity as being potentially harmful once I upgraded the computer to Windows 10, and promptly deleted my program that opens the Windows Explorer (now called File Explorer) window. The Hyper-Extended Oracle Performance Monitor program does not send keyboard commands to other programs, rather it uses Excel’s published remote macro interface. There is a small chance that the virus scanner on your computer could be trying to prevent this communication. Sorry for answering that late but I am just back from vacation. I can see the execution plan in IE and the query result in Excel. Thank you for testing the VBS script. That is good news that the script worked – that means that the Oracle OLEDB is installed and working correctly, and that the virus scanner did not block Excel from being remotely controlled through its published API. However, now I cannot explain why the Hyper-Extended Oracle Performance Monitor locks up when using a similar technique to enter information into Excel. I wonder if it is a problem with requesting Excel to delete extra worksheets? I might be able to put together a version of the program that does not delete the extra worksheets. Another thought is that maybe there is a default Excel workbook template or default Excel sheet template that is interfering? What version of Excel are you using (for example 2000, XP (2002), 2003, 2007, 2010, 2013) and what operating system (XP, Vista, Windows 7, Windows 8, Windows 10)? If you do see one of the above, close Microsoft Excel and rename the file. For example, if you found Book.xlt, rename that file to _Book.xlt; if you found Sheet.xltm, rename it to _Sheet.xltm. By renaming the files, you are able to easily revert back to the previous Excel behavior by setting the name back to the original name. If you renamed one of the above files, try to use the functionality in the Hyper-Extended Oracle Performance Monitor that previously caused the lock up. 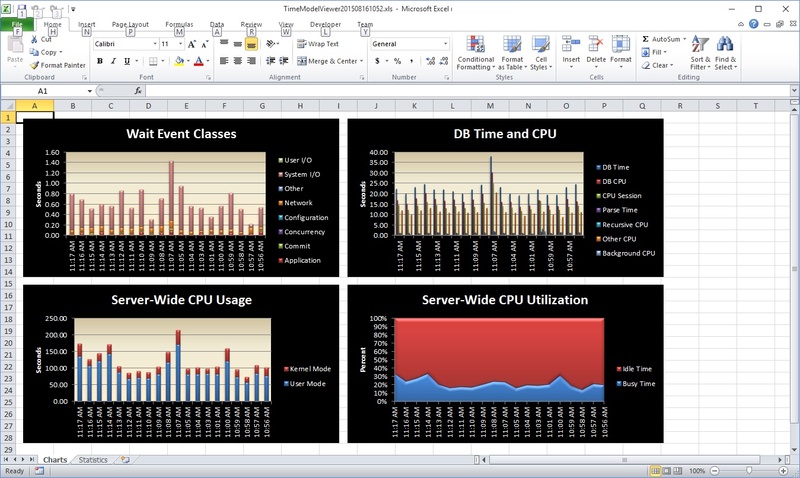 Do you think that an option to turn on and turn off the Excel charts in the Time Model Viewer and the Real-Time Performance functions in the program would help? I might be able to create a new Beta version of the program in a couple of days that adds that setting, if you are interested in testing the functionality. In that location, do you see a folder for the database that you connected to with the Hyper-Extended Oracle Performance Monitor? If so, open that folder. Are there any files inside that folder? On the other hand, I cannot switch off my F-Secure Client Security. It has been installed by a specific team responsible for installing and managering every PC through the OCS Inventory tool. OK, if you are on a computer owned by a company, I recommend leaving the virus scanner enabled. I do not have a folder named “%appdata%\Microsoft\Templates”. I only have a “%appdata%\Microsoft\” folder. After searching, I have the following folder with the string Templates in it. I have an Excel 2000 (9.0.2812 ) version along with a windows 7 Professional OS. When doing an Open … under Excel, I do not have any template to choose from. But I do have a folder named “%userprofile%\OracleLog” : the folder orcl ( my local instance ) as well as another folder ( a distant database I worked with ) are present under OracleLog. Nothing appears under the orcl folder whereas the Report.txt file appears under the other folder. I am interested in testing the Beta version of course ! Excel 2000 is a very old version. That said, it was not very old when I started creating the Hyper-Extended Oracle Performance Monitor program. I am fairly certain that the reports on the program’s main screen would open in Excel 2000, and I do not think that I have significantly changed the program code to alter how those reports are brought into Excel (the Time Model Viewer, of course, did not exist back when I used Excel 2000). I know that the Excel macro language (and therefore the published API) was different in early versions of Excel (the 95 version, for example), but I think that the syntax for Excel 2000 is roughly the same as it is in Excel 2013. I will have to see if I am able to find a computer with Excel 2000 still installed to see if it works with the Hyper-Extended Oracle Performance Monitor program. My mistake : “Open … ” is in fact the “New …” menu choice under Excel. C:\Program Files\Microsoft Office\Office\Xlstart is empty. C:\Documents and Settings\jmalzingre\Application Data\Microsoft\Excel\XLSTART is empty. C:\Users\jmalzingre\Application Data\Microsoft\Excel\XLSTART is also empty. * Create a report showing the Backup Log: Excel spreadsheet is created correctly with only a single tab (my program tells Excel to suppress errors, so that is why no warning appears when the extra worksheet tabs are removed). However, my program crashed and the Excel spreadsheet was not saved. It should have been saved with a name similar to OracleStatus201509021640.xls in the database folder inside the %userprofile%\OracleLog folder. * Time Model Viewer: Excel shows a message that the sheet will be permanently deleted (my program does NOT tell Excel to suppress errors, so that is why the warning appears – this warning does not appear in Excel 2003 and later). After clicking OK, my program crashes, the Excel worksheet is completely white, and the Excel spreadsheet was not saved (it should have a name such as TimeModelViewer201509021629.xls in the database folder inside the %userprofile%\OracleLog folder). * Real-Time Performance: Excel behaves as it does with the Time Model Viewer, and the program crashes when trying to save. The above results appear to be similar to your results. The above tells me that Microsoft must have changed the syntax of the command for saving the spreadsheet between the 2000 and the 2003 releases of Excel. I will use the Macro Recorder in Excel 2000 and 2003 to see if I am able to determine what changed between the versions. I think that we found the problem, so I just need to find a suitable solution and time to implement the solution. I checked the code created by the Excel macro recorder. The recorded code for a save operation is the same on Excel 2000 and 2003, but is different for Excel 2010. I tried making the program sensitive to the Excel version, issuing different save commands depending on the version of Excel. Excel 2003 does not crash when executing the save command, but Excel 2000 still crashes. I will have to look into this issue some more – as a short-term work around, I will try to have the program NOT save the Excel spreadsheet when Excel 2000 is used. I have some other programs that write to Excel and save – those programs work OK with Excel 2000 and above, but the programs were compiled on an old computer running Windows XP with Excel 2003 installed (and I think that I statically linked to the Excel 2000 published API in those programs, while a more recent Excel API is linked in the Hyper-Extended Oracle Performance Monitor). The above version of the program does not attempt to save any of the generated Excel spreadsheets on Excel 2000 through Excel 2003. Additionally, I have disabled the Excel application alerts so that you do not receive a warning on Excel 2000 when the extra tabs in the spreadsheet are removed. These changes fixed the crashing problems with the Hyper-Extended Oracle Performance Monitor on my test computer with Windows 10 Pro Insider Preview Build 10532 and Excel 2000 without any service packs installed. There is still a problem with Excel 2000, at least when no service packs are installed for Excel and it is running on the latest operating system. The copy-paste procedure in Excel 2000 fails when remotely requested through the Excel API. 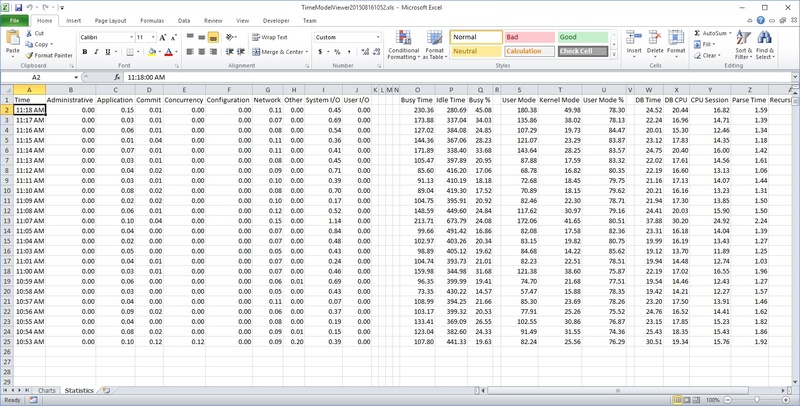 As a result, the Time Model Viewer’s Excel spreadsheet and the Real-Time Performance’s Excel spreadsheet only show the most recent statistics, rather than the 20 minute running history. I am interested to know if you see more than the most recent statistics (please wait a couple of minutes after starting the Time Model Viewer before deciding). Do I have to user the GRID32.OCX in a special way ? The Beta 3 version will show Hyper-Extended Oracle Performance Monitor 7.0 (Beta 3) in the title bar of the main program window. Beta 3 did not crash when I used it on Windows 10 with Excel 2000. The GRID32.OCX file is a Microsoft developed control (plugin) that allows the program to display certain information in a table (columns and rows, spreadsheet-like) layout on the screen. The Time Model Viewer uses this control to show the wait event information within the program, but it is also used in other places in the program (the simple reports do not use GRID32.OCX). It should be sufficient to have this control in the same folder as the Hyper-Extended Oracle Performance Monitor’s .EXE file. That said, this file when correctly installed is typically copied to the 32 bit System32 folder (C:\Windows\System32 on a 32 bit computer and C:\Windows\SysWOW64 on a 64 bit computer) and then registered with REGSVR32 on the Windows command line – as far as I am able to see, these steps are unnecessary if the file is in the same folder as the program. I have used the right version, with “beta 3” in the main program window, being connected with the system user. JUst want to report that your solution worked well for me. Loading Office 97 on winServer 2008 has worked for me before, but in this case, I was getting those StackHash errors everytime I tried to use an Excel sheet with VBA code underneath. * Check the computer with a program such as MalwareBytes to make certain that there is not spyware on the computer that is not detected by the virus scanner. * Try to disable DEP either in the computer’s BIOS, or just for specific applications (Excel and the Hyper-Extended Oracle Performance Monitor) – this may be difficult to do on a company owned computer. * Try replacing the RAM memory in the computer with new memory. The C0000005 exception code with 00000008 means a memory access violation, which is probably caused by DEP, but could also be caused by a failing memory card. Thanks for your last updates. I changed the nx value with Optin, rebooted and I now have a different event problem : APPCRASH. In the meantime, I am going to see if I can run MalwareBytes on my PC. * Data Execution Prevention (DEP) – but I do not think that could be a problem with your changed setting with bcdedit.exe – did you restart the computer after you made that change? * Virus or malware infection. * One person reported that they stopped seeing StackHash errors when they right-clicked the program and selected Run as Administrator – you should not need to run my program as a local machine administrator. * A lot of people did not receive a response when asking about StackHash errors. Good luck with MalwareBytes – when you run the setup for the program, do not select the 30 day free trial for the Pro version of the program. In Excel 2000, when you click the Tools menu, and then Add-Ins… are there any items in that list that have checkmarks next to the item? I actually restarted my computer after the update of the nx key. I have deleted those two files. PS : perhaps I should ask for an Excel 2003 version ? It is possible that there are other spyware/viruses on the computer, or possibly some files on the computer is damaged due to a previous infection. MalwareBytes is usually very good at detecting and removing spyware, but it occasionally misses some spyware. TDSSKiller is another good utility for checking for spyware – it has occasionally found problems that were missed by the Trend Micro virus scanner and MalwareBytes. This program is free, and is made available by an antivirus company. If you decide to try the program, click Change Parameters in the program and put a check in the box “Loaded Modules” – TDSSKiller will then need to restart your computer before you are able to instruct it to scan the computer. Reinstalling Excel 2000 or installing Excel 2003 might help. However, the access violation errors (related to the StackHash messages and BEX errors) suggest that there may be another problem that will not be solved by just reinstalling Excel. I do not have a good explanation why you are seeing the error messages. TDSSKiller has found no threat event after a reboot. I will let you know in case I have an idea. I am getting error while connecting. Couldn’t understand the error. Please see the screenshot and suggest what could be wrong. Does it generate log file anywhere which i can check? I have created DSN which is working properly. I may be releasing a slightly updated version of the Hyperextended Oracle Performance Monitor soon that fixes an issue with the long cursor numbers found in Oracle Database 11.2.0.2 and later 10046 trace files.